Took weeks to put it together, dealing with “scum of the earth” car salesmen. Found a dealership and a salesman unlike all the others. 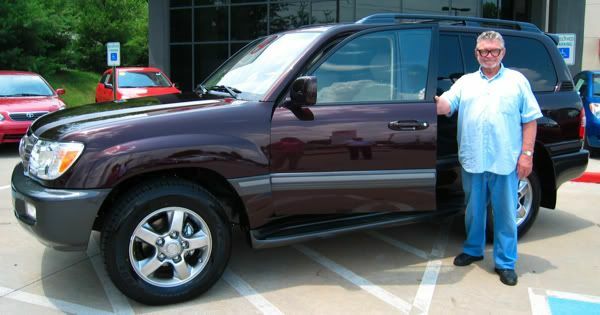 Great folks to deal with, and put the deal together on the vehicle of my dreams. Fully loaded with all the options and accessories and only cost $63,500 total including tax, license, etc. Did I say ONLY? Oh well, what the heii. At 74 might as well go first class. Might kick off any day (or minute). Photo of me just before driving it home. WOW first class ride. Nice rig. For boat pulling duty also, or just lookin' good? Very nice SUV. Did you pay for it out right ray, or did you finance? Looks like you have the Sahara with all the leather. As Bette Midler sings in "Knight in Black Leather ".........smells just like a brand new car. I got a new Cruiser early in the year. The V8 is smooth. Last of the 100 Series. The new & unproven 200 Series will be on sale later this year. 5 litre V8 petrol with twin turbos or 4.5 litre diesel with twin turbos. I think you got the last of the best. We noticed that you've recently increased your wealth. Congratulations. We want half. My son will be thanking Apple too when he goes to college in 5 years. Congratulations! It's nice to be able to set yourself up for a good ole spoiling every now and then. Enjoy the new ride! Thanks, Fellas. And, of course, thanks to Apple for the stock I sold to pay for it. Snapper Head.....Not just looking good. My old (1995) 6-cyl LandCruiser pulled my boats just fine and conquered all the launch ramps with ease. Incidentally, here in Tennessee we have a few launch ramps that are really steep. 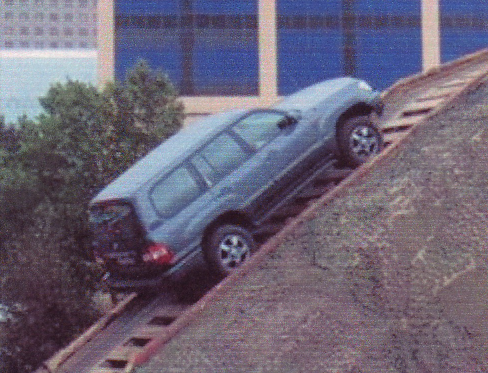 With this new V8 I’m sure no launch ramp will be any problem at all (See photo below). It has a 6500lb towing capacity. Bugbuster.....HeII yes I paid cash for it. Who could afford those high payments? Besides, to finance it would have put the total cost right at $80,000.00. Peterbo3.....Me thinks you have a slightly different version in Australia than we do here. However, wherever they are, the LandCruiser is a fantastic vehicle. Glen E.....Yep, Apple has a long way to go (UP). When the stock gets to $180.00 a share I will take out enough to pay off my house and still have my original investment left in the stock. Today the stock has more bounce than in a basketball game, but who cares. We will see $180.00 a share soon enough. I can’t say it too often, (as you and I know) these lows are just a terrific opportunity to buy Apple stock. Eyeball.....I have no problem paying my taxes. I‘m fortunate to live in a wonderful country with the opportunity to make the kind of money to pay taxes on. I have visited most of the countries of this old world and I will stay right here and gladly pay the price to live here. FASTFJR.....A great expensive college at that. You can bet the IPhone will be sitting next to my IPod on the console. This thing is Bluetooth equipped so has hands free phone operation with buttons on the steering wheel. To borrow your slogan, I was also born OK the first time. Darwin Rocks! Eyeball.....So just buy stock in both of em and you are set for life. I drove a Land Cruiser all over NW Australia back in the 70's. It was a fantastic vehicle. It even kept going after a kangaroo re-arranged the sheet metal. You look fatter in person than in the sketch.